The arrival of P.J. Whelihan’s to Berks County last fall was a big deal. In the past year, search terms like “PJ Whelihan’s Reading” and “PJ Whelihan’s Wyomissing” have driven hundreds of clicks to news articles on this blog. It’s not really a surprise. 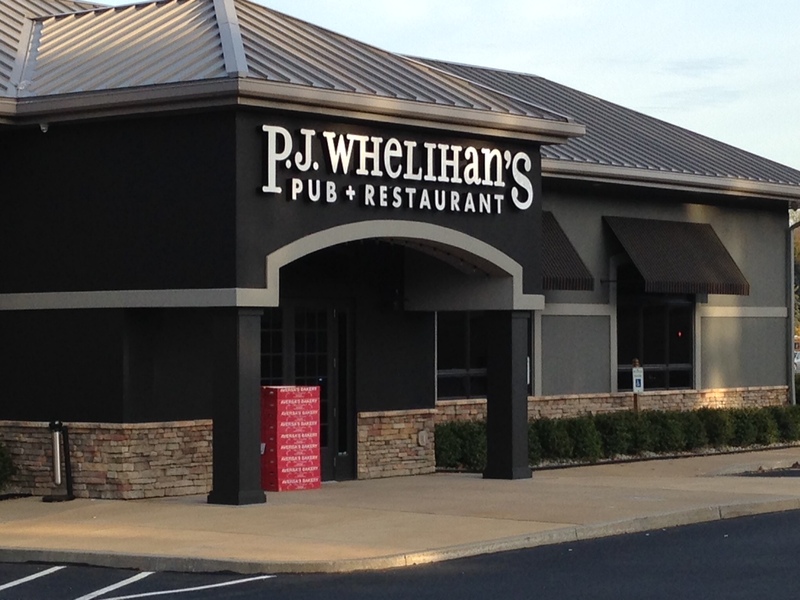 Since the first P.J.’s opened in Allentown in 1994, they have built their brand throughout greater Philadelphia. The Spring Township location was the 15th and farthest west for the franchise, finding a clientele that was obviously looking for them. And if P.J. 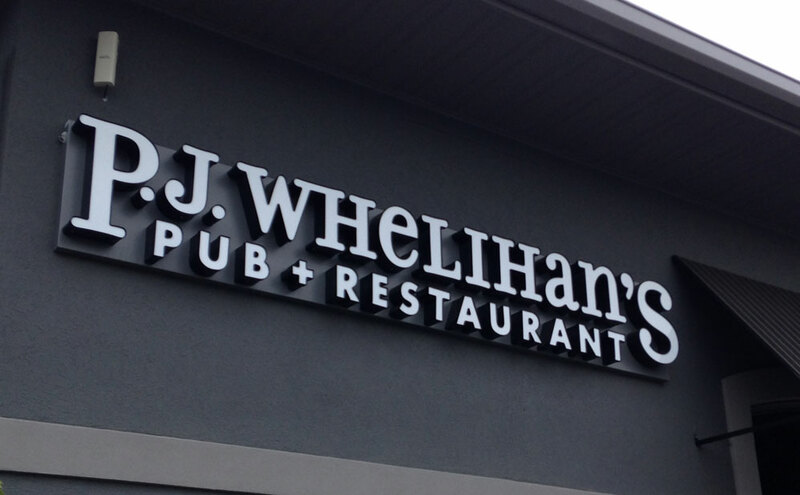 Whelihan’s wanted to go big with its Berks County location, they picked the right spot. Toscani had built the restaurant into one of the largest in the area, with a spacious dining room complimented by the semi-enclosed outdoor patio. Julie and I were seated at an oversized booth along the wall, one large enough to comfortably fit six or more. Dead Jimmy was performing throughout the evening. His acoustic songs were mostly subtle background noise, but when he really let loose, our conversations had to turn to shouting just to be able to hear each other. The menu is printed on the paper placemats, and is your typical bar food staples like burgers, sandwiches, fried appetizers and P.J.’s famous wings (the official wings of Wing Bowl). Julie decided to start her night with a little drink (it is a bar after all). 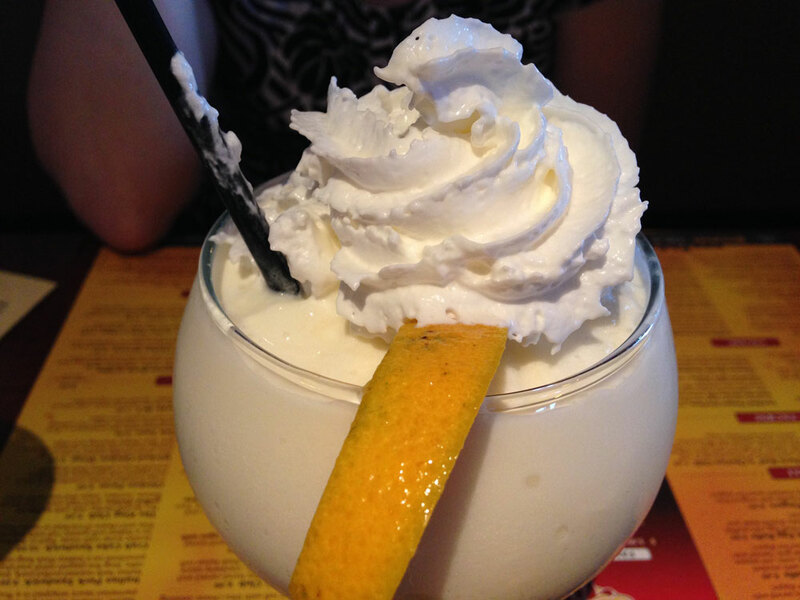 While P.J.’s is heavy on the beer selection, it did have a few frozen drinks available, including the creamsicle margarita, which looked more like a milkshake topped with whipped cream. While Julie happily sipped it all night, she was hoping for orange creamsicle. Instead, it was slightly tart, like original frozen yogurt. It was good, but probably could have used just a little more sweetness. On the back of the frozen drinks menu were the specials for the evening. One of them caught my eye more than anything on the regular menu: the avocado chipotle burger. When the burger arrived, it looked great, but I had to dig to find the avocado. There was a roasted tomato slice and plenty of chipotle cream on top, but no avocado. Thankfully I found them, hiding beneath the large (probably 1/3-pound) patty. The chipotle sauce was a little overpowering, and while I certainly enjoyed every bite, I thought it could have gone from good to great with a little less sauce and a little more avocado. The burger was flanked by an order of P.J.’s “Famous Fries.” Crinkle-cut with an Old Bay-like seasoning, Famous Fries look and taste a lot like another Philadelphia-area favorite: Chickie’s and Pete’s Crabfries. The only differences being that P.J.’s is thicker cut and—at least this batch—a little saltier. They were still good, it just took a little more ice tea to wash them down. 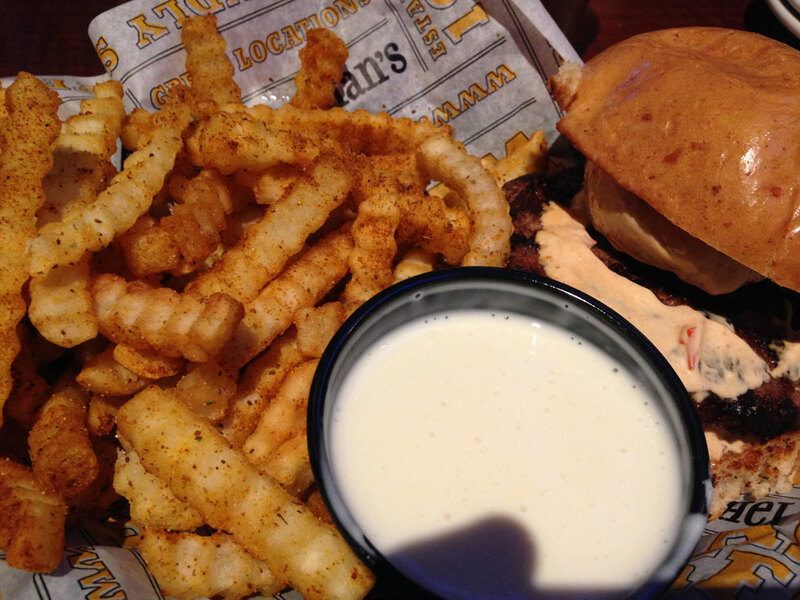 Julie also ordered a side of Famous Fries to go with her entree of the choice, the short rib melt. The braised beef was topped with three kinds of cheese, but it was the provolone that really shined and made it an excellent meal. 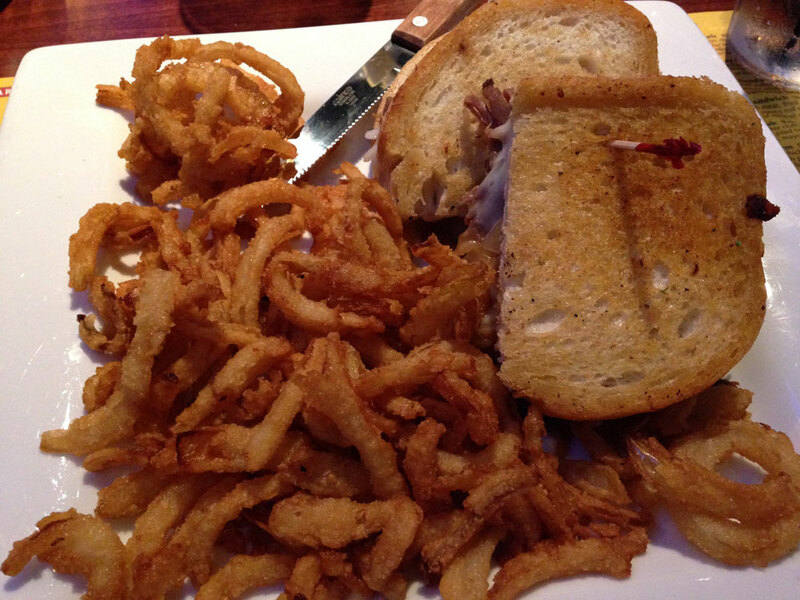 P.J.’s short rib sandwich comes served with a mound of onion tanglers. Smaller and thinner than typical onion rings, the tanglers were more like something that would normally be served on a sandwich, not as a side. They were really good, but so rich that it was impossible for Julie to finish them. Half of Julie’s fries and most of her onion tanglers came home with us so she could enjoy them throughout the week with her lunches. So for less than $25, we got more than a couple meals (our drinks brought our total over $30 for the night). P.J. Whelihan’s doesn’t try to hide what it is. It’s a Philly sports bar, a place to catch the game with friends, enjoy some drinks, and eat lots of fried food. It’s your local bar, just a lot bigger.